Merry cold snap, everyone! If you're stuck in the same rubbish hemisphere as me, you may well deem it a good time to hunker down and take up a new, indoor hobby. While gorging yourself on whatever highly calorific confectionery and ethanol-heavy beverages you've recently acquired is certainly an option, far healthier and more creative choices are available. Perhaps, as a fan of artwork depicting prehistoric animals, you'd like to consider creating your very own 'palaeontography' with which to attract baffling comments from sarcastic creationists and feather-haters on deviantArt. 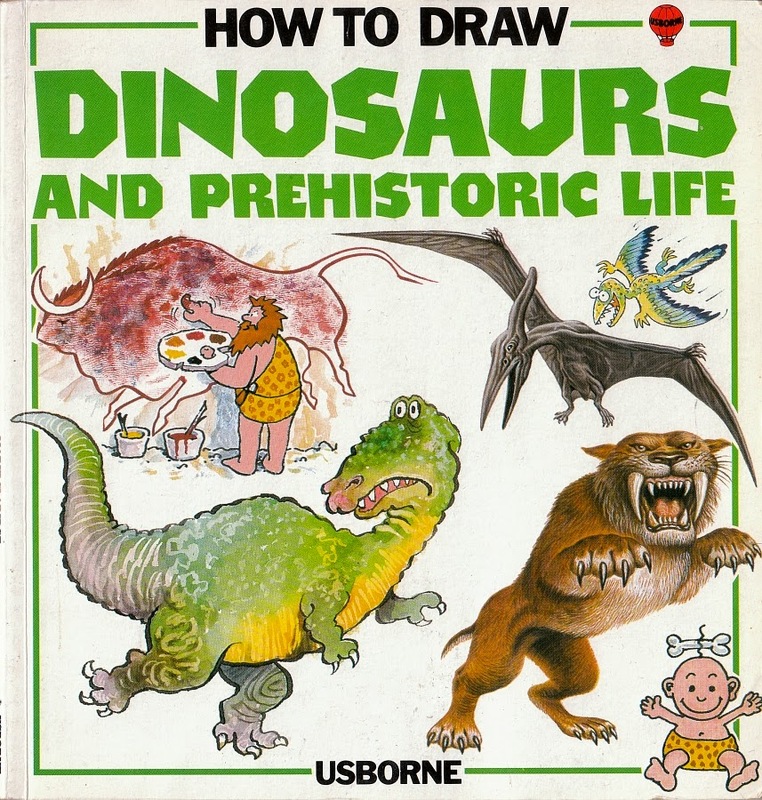 If so, this retro-tastic 1990 book from Usborne is here to help. Last week I shared some pixel art dinosaurs I was working on and said I'd been continuing them as a series. It's a fun little project to kick off 2015, with a new one shared every Friday, and added to my Redbubble shop as well. 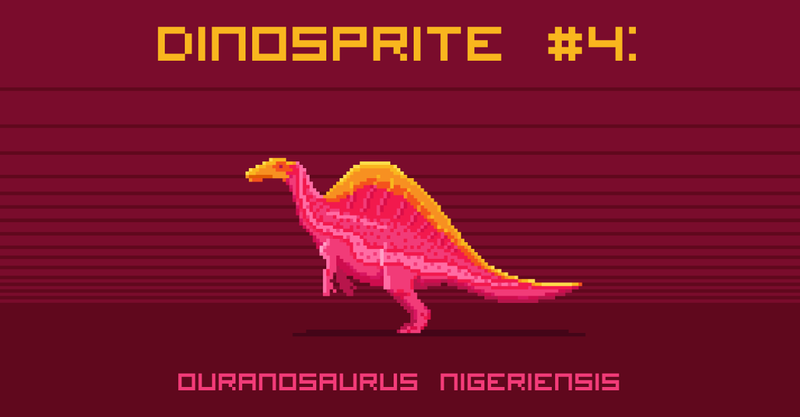 I've decided to call the series Dinosprites, because it seems like a pretty catchy name. I'll mainly be sharing this at Facebook and Twitter, but I'll probably post the full series here in a few months when this series is complete. What I want is an immersive, I-just-time-travelled-to-the-Mesozoic feel, with a great score and as little anthropomorphism as possible. There's no way that film gets made anytime soon. There's hope, though. Who knows what will be possible as the technology gets cheaper and dinosaur fanatics get more motivated to make something on their own? Or perhaps expecting a feature film is the wrong way to look at it. Maybe the dream of an immersive exploration of prehistory is better left to game designers, like the folks behind Saurian. The Hell Creek ecosystem, as seen in Saurian. 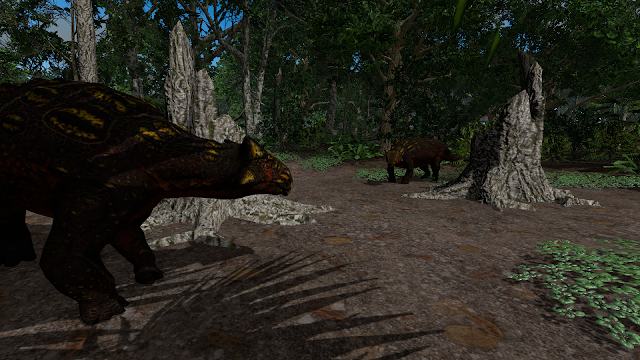 Currently in development, Saurian is a survival-based game seeking to recreate the Hell Creek ecosystem of the end-Cretaceous. It's clearly a labor of love, and as news and in-progress work has been shared, I've been getting more excited. With the release of their first gameplay trailer, I thought it was a great time to interview the team about the project. 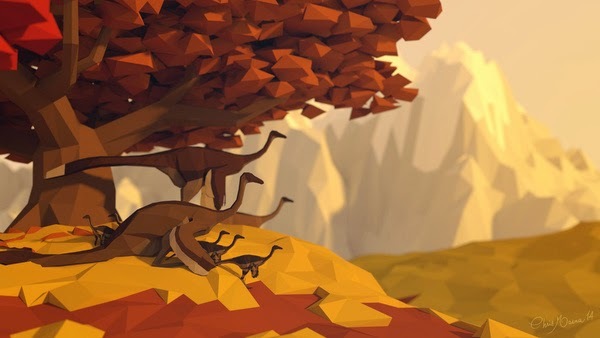 At IndieDB you write that your goal is to create "the most captivating dinosaur experience ever developed for commercial gaming, giving the player the first true chance to live like a dinosaur." What games, films, or other pieces of art or entertainment are inspirations in this quest? Nick Turinetti, Project Lead: We’re obviously huge dinosaur fans to be making a game like this, so between all of us we’ve probably gotten our hands on every game that’s featured dinosaurs in one way or another over the past 15 years. Having said that, in our collective opinion most of them were not terribly impressive. Two games that have directly featured dinosaurs that have had real influence on Saurian would be “Big Al Game” from BBC’s Walking With Dinosaurs website (sadly no longer available) and Be the Dinosaur which was actually developed as part of a museum exhibit of the same name. Other non-dinosaur video games that have been especially influential are Far Cry 3 and 4, Red Dead Redemption, Skyrim and Dark Souls. As far as films go, we’re all fans of the original Jurassic Park. We never go a day without quoting it half a dozen times at each other. Phil Tippett’s short film Prehistoric Beast is still probably the best dinosaur film ever made, and its mood and tension are something we aspire to. Peter Jackson’s King Kong and James Cameron’s Avatar with their expansive world building have also been major sources of inspiration. Thescelosaurus, showing off its quilly finery (top) and seeking refuge (bottom). 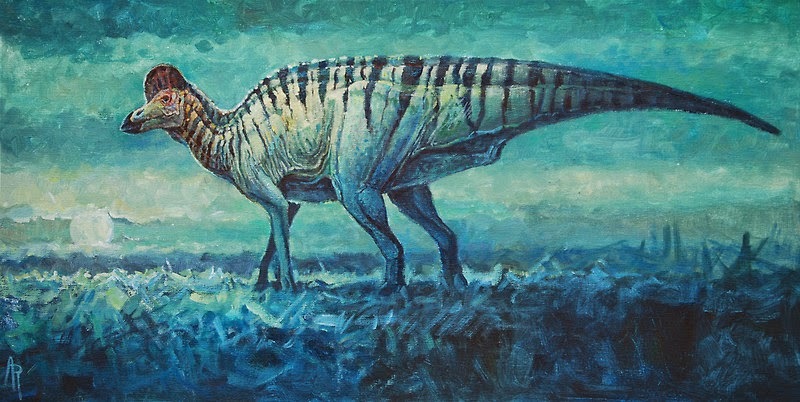 Are there specific pieces of paleoart that have served as inspirations for the vision of Saurian? Tom Parker, Environment and Level Design: All of our artists are inspired beyond anything else by the collective works of Doug Henderson. If we could achieve a visual style with Saurian that resembled a Henderson painting in motion then we would consider our job well done. 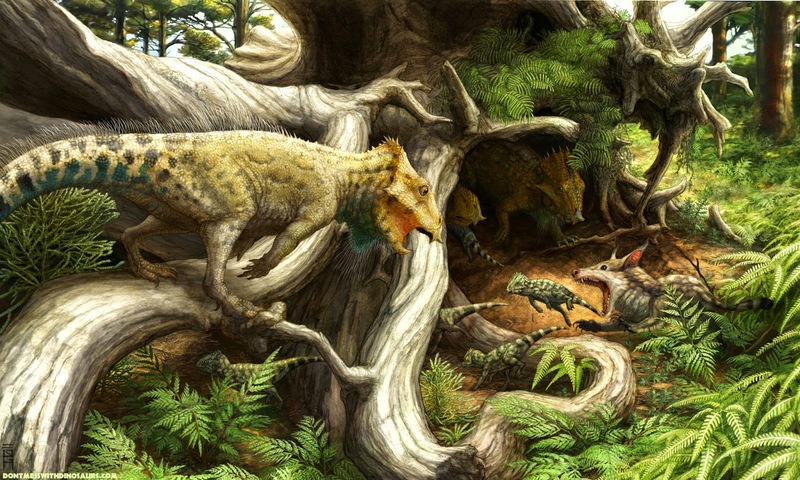 His Leptoceratops piece in particular captures a sense of environmental scale that we adore. His animals look like they are a part of the environment and not separate from it, which is something we want to capture. Our other key influence would be the so-called “All Yesterdays” movement, particularly the titular book and the palaeoart of Matt Martyniuk. We take on this philosophy of experimenting with interesting visual design without ever contradicting the fossil evidence. Matt Wedel of SV-POW! once said “If you go bold, you won’t be right; whatever you dream up is not going to the same as whatever outlandish structure the animal actually had. 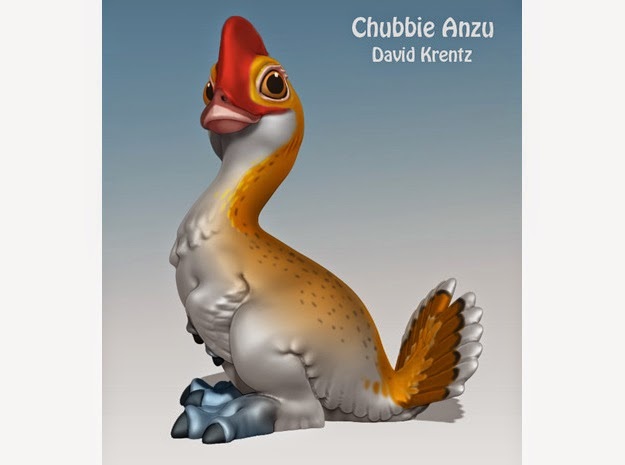 On the other hand, if you don’t go bold, you’ll still be wrong, and now you’ll be boring, too”, and this has also played a role in our creature design. I don’t know if this counts as inspiration, but we are extremely grateful for the skeletal reconstructions of Scott Hartman which allow us to get our animals as accurately proportioned as possible. 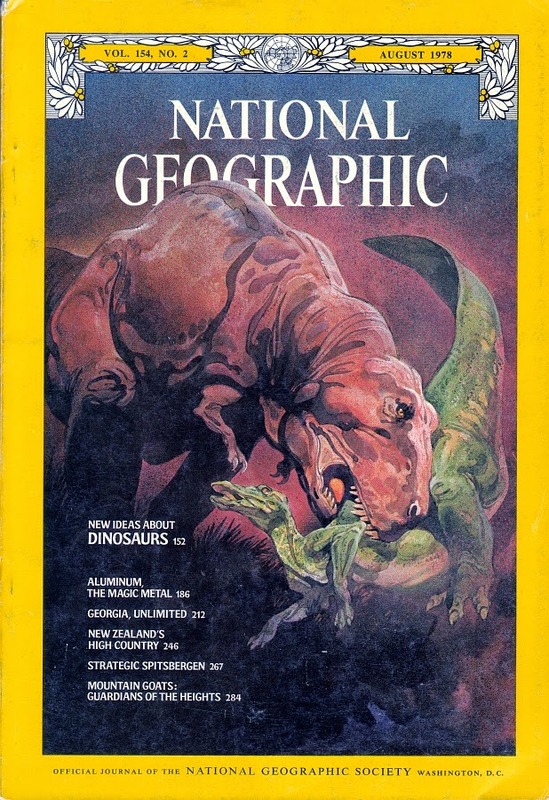 Other influential palaeoartists include classics like Charles R. Knight, Zdenek Burian and James Gurney. Like Henderson, these artists are all masters of incorporating the animals into their environments. Henderson and Tippett are certainly perfect inspirations. Prehistoric Beast really hasn’t been equalled. In every frame you can feel the love of Tippett’s team. In what ways do you hope to evoke its mood and tension? Nick: It might sound silly but I find Prehistoric Beast legitimately chilling, and a lot of that has to do with the way Tippett portrayed the tyrannosaur; a sly, cunning predator who skulks in the shadows despite being the size of a bus, making even a peaceful meadow a dangerous place to be alone. That’s the sort of mood and tension we’d want to evoke in Saurian, both for someone playing as a predator like Tyrannosaurus or as its potential prey. Even in the game’s current (very early) state, I think we’ve started to capture it. Being chased by a T. rex is scary, but watching it move through a forest clearing and knowing it’s looking for you is scarier. Being alone in the same meadow and not being able to see it or know where it might be automatically puts a player on edge as well. I never want a player to feel completely “safe” when playing Saurian, there should always be something out there to keep you on your toes. Why was Hell Creek chosen as the setting? Were other localities considered? Tom: Hell Creek has always been the plan. There are a few reasons as to why it is the best choice for this kind of project. 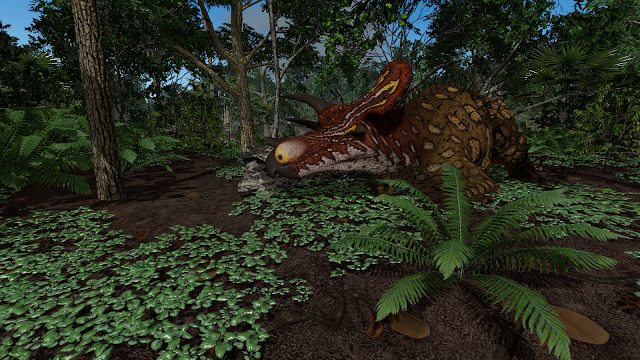 Firstly it offers a quality combination animals such as Tyrannosaurus, Triceratops, Pachycephalosaurus and Ankylosaurus that are extremely popular and instantly recognisable to the general public along with other more unique fauna that offer an interesting variety. Secondly, the formation is one of the absolute most studied and published-on in the world in terms of flora and palaeoenvironment. This is important to us as it makes our job of restoring the environment much easier and less ambiguous than other, less well-documented ages. Nick: Another benefit is that the Hell Creek Formation records a comparatively short period of time compared to many other formations, so we can be reasonably confident that all of the animals found there did in fact form one community. You recently brought RJ Palmer on board. How did you come to recruit him, and what has he brought to the process, besides the obvious role of creature design? RJ Palmer, Concept Artist: I found these guys from some tumblr post that was going around. I showed them my dinosaur drawings and shoved my way onto the team. I like to think I bring an outside perspective to the group as I joined later in development and can look at things with the eye of an artist and not a scientist. I bring some connections to the party such as helping with expanding our audience. Nick: RJ’s fresh perspective has helped push us outside of our comfort zone when it comes to creature design, and we’ve definitely improved because of it. He’s also been really good at asking the tough questions in our design process, making sure we’ve fully explored all options. 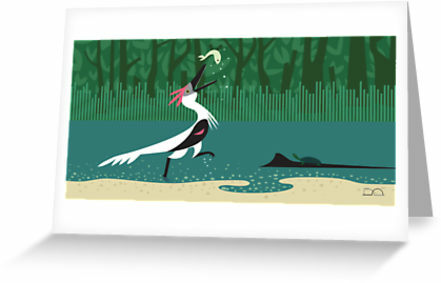 RJ Palmer's Quetzalcoatlus design, here nomming on a champsosaur. I'm assuming that the score used in the pre-alpha gameplay trailer is not final. What do you foresee concerning the sound design? What are the challenges of bringing the environment to life through sound? Dillon Gotham, Sound Designer: For what the future entails, many important animals (both in public conscience and in ecological importance) to be voiced are small, which present their own challenges compared to large animals, and while animals tend to be silent on the hunt, when fighting conspecifics they are not. Simple, repetitive attack sounds will not do. As for the general challenges of Saurian’s sound design, currently none of the team is reliably able to record audio in the field; it is primarily audio libraries that are available for me to work with. But that does not mean the world of Saurian and its inhabitants have to sound like it. Saurian must sound unique and charismatic, yet also as naturalistic as it looks. For animals, this means mixing and masking their individual elements to become its own character. Because the stars of the game are archosaurs, in the process of creating sound effects for Saurian I add modern archosaurs to the mix and emphasize them whenever reasonable, but there are limits; as an example, passerine birds evolved after the K/Pg mass extinction; they are almost entirely off limits as they more often than not live up to the name of “songbird.” This also means I also need to ensure there’s no songbirds in background sounds! I've been pondering the failures and clumsy handling of dinosaur media recently - for example, the addition of voices to WWD3D and the meddling that compromised Dinosaur Revolution. It seems that the revolutionary role Jurassic Park played in dinosaur pop culture has many of us hungry for that next big moment, and all of these fumbles are more dispiriting for it. I personally think that it is going to come from gaming (Saurian is certainly the most promising project I’ve seen). Do you think there is hope for traditional storytelling media such as film and animation to tell a dinosaur story that captures popular imagination and makes dinosaur enthusiasts happy? Bryan Phillips, Animator: When I set about animating one of Saurian’s animals, I tend to stay away from established media such as Jurassic Park and Walking With Dinosaurs, oddly enough shows like Big Cat Diary play a much larger role in creating the character of the animals in Saurian. 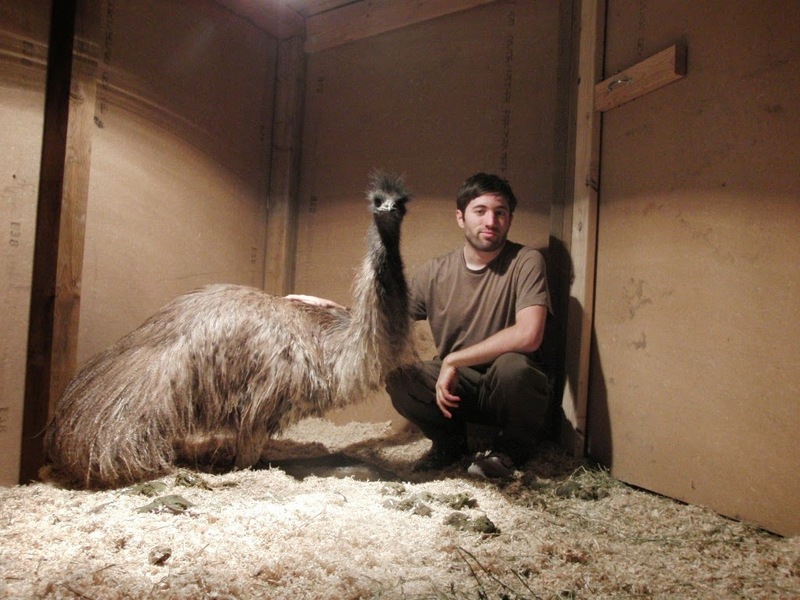 We’re also probably the only game developer out there to have our own Emu and he plays a large role in the animation behind our bipeds. I do believe there is hope for new works, the trick is staying grounded in the fact that these aren’t monsters, they were living, breathing animals who in practice were likely no different than animals living today. Tom: A big thing for us from the outset has been that we were not interested in creating a game where extinct animals are nothing more than glorified canon fodder. They are essentially treated in video games in the same manner as zombies and aliens. We feel strongly that this should not be the case. Dinosaurs are in our opinion some of the most interesting animals to have ever walked the planet and deserve to shine on their own merits. Nick: I think there is still hope that film and animation could tell a dinosaur story that appeals to the general public, the problem is that Jurassic Park and its framework loom so large in popular culture that people have a hard time thinking outside the park (terrible pun, I know). So many films and games just vomit out cheap Jurassic Park knock offs that people have come to expect that as “normal”. My suspicion is that it will take a generation to really work JP out of the public conscious now that Jurassic World is a thing, and that’s a bit disappointing because there are so many other good stories out there that don’t have Jurassic Park’s baggage. I would love to see Raptor Red or Cretaceous Dawn turned into a visual experience. An Ankylosaurus meetup (top); Saurian Animator Bryan Phillips with Gerry, the trusty model (bottom). 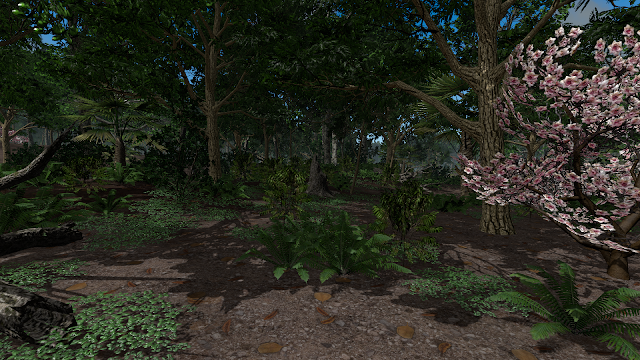 How has the online community contributed to the process of Saurian? When I think of when I was a kid, I would have been blown away to have the access I do now to dinosaur experts and paleontologists. Nick: I think its safe to say Saurian would still be a pipe-dream were it not for the incredible access to information and experts the internet provides. We’ve had the good fortune of having a small support network of university students with access to most major scientific publications, but we’re huge supporters of Open Access. We’ve also had the ability to ask questions directly of paleo workers as well, including Denver Fowler, Matt Wedel, Gregory Wilson and John Hutchinson, all of whom have been extremely helpful with their critique and input. Beyond access to information, Saurian’s development team would still be a bunch of really talented people all still wishing they could find other people interested in making a game were it not for the online communities we’re all part of. Except Bryan. He’d be doing it all by himself regardless. Many thanks to the whole team for taking the time to answer my questions. I'll definitely be watching their progress eagerly. Be sure to follow Saurian's evolution at IndieDB, Facebook, and Twitter. Also check out their recent interview with Brian Switek at Dinologue. 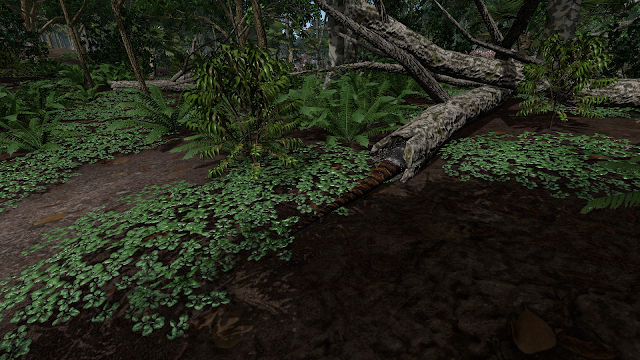 All images in this post kindly provided by the Saurian team and posted with permission. The Danek Edmontosaurus Bonebed is the subject of the new issue of the Canadian Journal of Earth Sciences. An important site for both research and outreach, the bonebed has produced over 800 specimens, dominated by E. regalis, but also containing the northernmost specimen of Albertosaurus, Troodon, and a bonus ceratopsian horncore. More: Everything Dinosaur and Phys.org both featured articles about the bonebed. University of Alberta PhD candidate Michael Burns was interviewed about the issue in general at Canadian Science Publishing. The introduction is available for free[PDF link]. 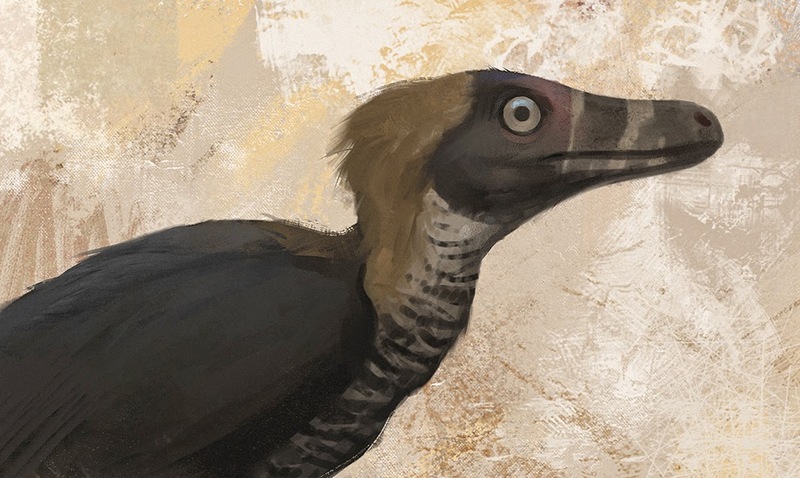 Rebecca Groom's rooster-y troodontid is gorgeous! The superlatives are tripping over themselves to stampede out my mouth. More book reviews from Herman Diaz at ART Evolved, this time focusing on a pair of titles from the Walking With Dinosaurs franchise. 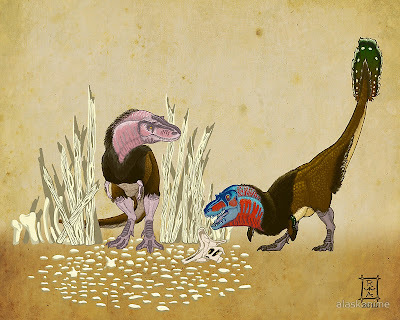 Gareth Monger is really delivering the goods in the early days of his Pteroformer blog, including this post about the need to stay open-minded as research changes the look of prehistoric animals. At SV-POW, Matt Wedel tips us off to the publication of his description of a new Haplocanthosaurus specimen, in the free-to-access journal Volumina Jurassica's new issue, which focuses on the Morrison formation. Brian Switek writes about research into the ranges of the Cretaceous sea bird Hesperornis, taking the approach of studying extant penguin growth rings. Liz Martin writes about one of the big reasons 2014 has been good to paleontology fans: two new pterosaur bonebed sites, which are exceedlingly rare. The Brazilian and Chinese sites feature multiple three-dimensionally preserved specimens of Caiuajara and Hamipterus, respectively. They really are treasure troves, adding new insights into social behavior, egg morphology, sexual dimorphism, ontogeny, and habitat. Read on at Gimpasaura. Ben Miller offers a look at The Last American Dinosaurs, an exhibit at the National Museum of Natural History. It looks amazing, and I agree when he writes that he's "...a fan of this personalized approach to science communication. In-house scientists are museums’ most important and unique resources, and placing them front-and-center reminds visitors that science is done by real and diverse people, not caricatures in lab coats." You may see Albertonykus at The Last American Dinosaurs in his role as a docent, but his recent museum visit post takes you to the Cleveland Museum of Natural History instead. Fernanda Castano wrote a nice primer on the Anthropocene at Letters from Gondwana. 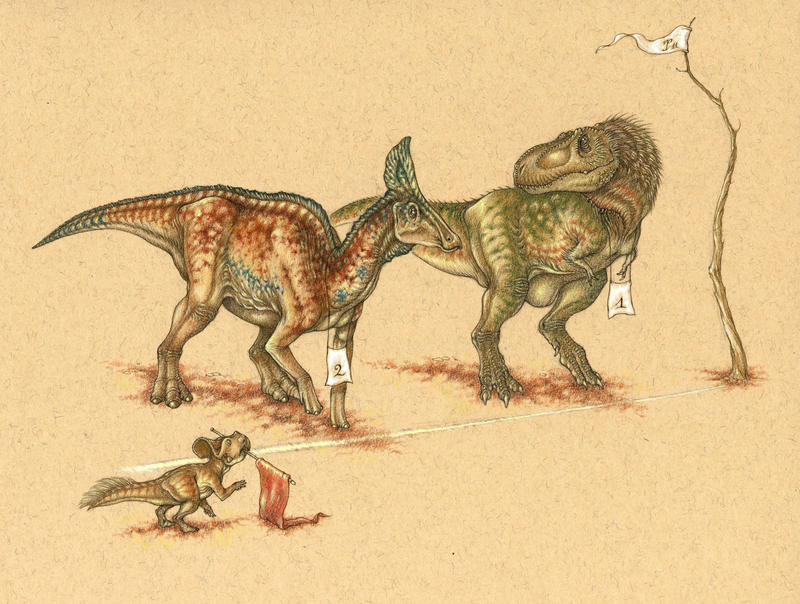 A clumsy Aucasaurus was the subject of one of Mark Witton's paleoart commission specials, and a unique piece it is - a bit of slapstick humor but beautifully rendered. Lisa Buckley wrote about visiting the type locality of the ichnotaxa Ignotornis mcconnelli, sharing plenty of great photos from the site. The Dinosaur Toy blog featured a review of the new CollectA Mosasaurus. They also previewed a mixed bag of upcoming figures from Schleich. The Kentrosaurus is nice, at least. Gray-Necked Wood Rails are Awesome (and Kind of Obnoxious). Apsaravis has done a gorgeous series on carcharodontosaurids, including this Acrocanthosaurus. You can and should buy prints of her work at DeviantArt. Acrocanthosaurus atokensis, © Apsaravis, used with permission. In my day (and night and weekend) job as a freelance designer and illustrator, I recently was hired to do some advertising illustrations in a pixel art style, emulating the look of 8-bit video game graphics. It was a reminder of how much fun I had drawing on the old Tandy personal computer my family had in the late eighties, in which I would draw elaborate scenes inspired by the Sierra games I loved - especially the King's Quest and Space Quest series (for some reason, I was never allowed to play Leisure Suit Larry). I love chiptune music as well, so slipping into this complimentary realm felt very comfortable for me. What came next was inevitable, I suppose: I began experimenting with pixelated saurians. It's been a fun exercise, and has actually given shape to a long-gestating project I've had in mind. The process of creating pixel art of dinosaurs fits in well with the driving inspiration of many of my design series, such as Cladistic Heraldry: how little visual information do you need to recognizably depict an extinct animal? Pixel art is all about that, of course. It leaves the viewer's imagination to fill in the visual gaps. I've enjoyed creating these low-resolution archosaurs so much that I'm going to be releasing one every week for the next several weeks. To start, I translated my 2012 Anchiornis into a sprite. 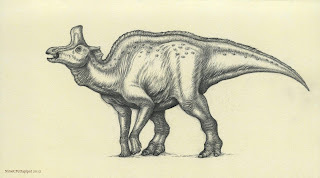 Next, I chose Amargasaurus, one of my favorite sauropods but one I've never drawn. Most recently, I heeded my wife's sage advice: "You should do one that people have actually heard of!" Thus, Tyrannosaurus rex. 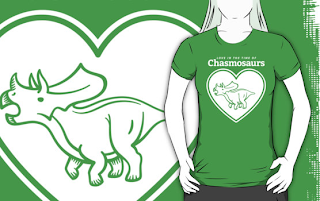 Naturally, I am designing merch for these designs in my online store, in my quest to have a ginormous shop full of a diverse array of prehistoric animals. Mugs, stickers, and tees are all available at my Redbubble shop. I'll be sharing these weekly at the LITC Facebook page; like us there for treats like these, post sneak peeks, and scintillating conversation. The early history of ceratopsians is mostly known from Asia, so it's with great fanfare that Andy Farke et al. present Aquilops americanus, a 106 million-year-old animal from the Cloverly formation (unit VII) of Montana, USA*. Accompanying the paper (published today in PLOS ONE) are a number of superb artworks from renowned palaeoartist and occasional soggy-looking rapper Brian Engh - not only depicting the tiny, spiky-cheeked Montanan of long ago, but also placing it in a richly realised palaeoenvironment. They're quite ravishing to look at, I'm sure you'll agree, and happily Brian was more than happy to share the full story behind them. All artwork is © Brian Engh, used with permission. Do not reuse without permission, or a Gobiconodon will get you. Just as the previous installment of Mesozoic Miscellany went up, the Jurassic World trailer hit the web, sparking conversation, argument, and ranting that continues unabated. From a JP-virgin's-eye-view to a celebration of my personal favorite scene of the original film to an interview with a leading figure in the online JP fan community, we've certainly written many words about Jurassic Park over the years. I vacillate daily about whether I should chime in about Jurassic World. I find I have sympathies with "both ends of the spectrum," leaning more towards the negative side, but wonder how much I can really contribute to the conversation. Anyhow, we'll see if I can resolve my own feelings to the point that I feel like posting about the trailer and the issues that have been discussed over the last couple weeks. In the meantime, here is a collection of writing that represents this sprawling discussion pretty well: reactions positive, negative, and pragmatic. First up, a brief interview with Jack Horner himself about his role as an advisor on the franchise. Oddly, he seems to think that riding down a river populated by titanic sauropods and thagomizer-bearing stegosaurs would be no more dangerous than being around cows in a pasture. Which seems kind of unlikely. Tony Martin wrote about the ichnology of the Jurassic World trailer. John Conway's been particularly vocal, and with his hilarious grumpiness concerning most movies he and Darren talk about on the TetZoo podcast, you can probably guess where this is going. He's not just bashing it for the sake of it, however: he's specifically annoyed by the ways critics of the JW dinosaurs are dismissed as being supercilious nerds. He's written some of the best defenses of JW critics so far, at his blog and in a guest column at the Guardian. He and Darren have a fun conversation on the latest TetZoo podcast, as well. On the other hand, Chris DiPiazza offered his perspective at Jersey Boys Hunt Dinosaurs, and is pretty excited for the movie - especially to see what's going on with the seemingly trained pack of raptors. At the Ornithischian Revolution, Ali Nabavizadeh shares similarly optimistic thoughts. The Jurassic World website, presented as a straight-faced corporate site dedicated to the working park in the fictional JP universe, was launched around the time of the trailer. It's pretty well done, and offers some glimpses into the design of the working theme park. However, paleoartist Brian Choo noticed that icons on one of the attractions bear strong resemblance to various illustrations, as if the production designers didn't really, y'know... care about copyright. Matt Martyniuk and Glendon Mellow both cover the issue at DinoGoss and Symbiartic, respectively. At Prehistoric Pulp, Walt Williams singled out the overt nostalgia-baiting of the trailer. "I don’t want a film whose main draw is reminding you of that great movie you saw as a kid. I want it to stand as a good film on its own." Will Svensen at Tyrant King Productions is disappointed by what he thinks are boring, badly rendered dinosaurs. At Antediluvian Salad, Duane Nash takes a pragmatic look, putting the whole JW kerfuffle into context while not necessarily forgiving its flaws. The mosasaur in the JW trailer is pretty freaking huge, and both Zach Miller and Craig Dylke have posts about it. Finally, check out the funny Bouletcorp comic about a realistic Jurassic Park. 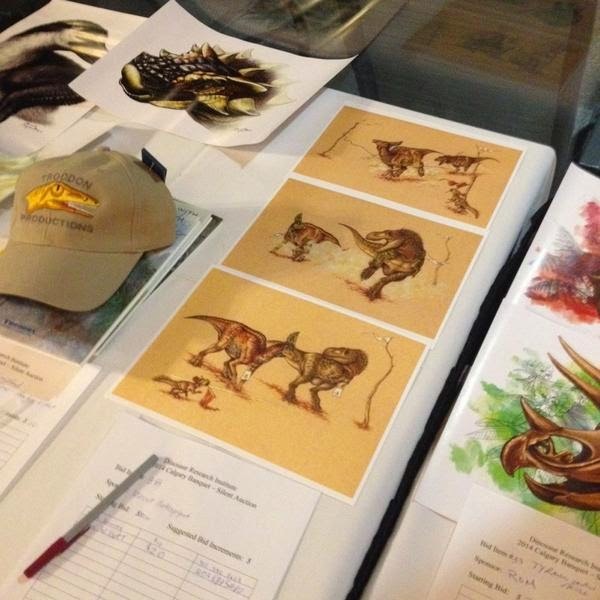 There are some new kids on the block that I've seen pop up: first is Gareth Monger's new Pteroformer blog, in which he discusses paleoart as well as sharing progress on his new book project. The second is "Thagomizers," a video series exploring paleoart and pop culture's history of popularizing paleontology (that's a lot of P's). The first episode, introducing the series, went up in November. The American Museum of Natural History in New York City (NEW YORK CITY!?) also launched a new video series. "Shelf Life" explores the museum's collections in monthly videos. Here's the first installment, "33 Million Things." 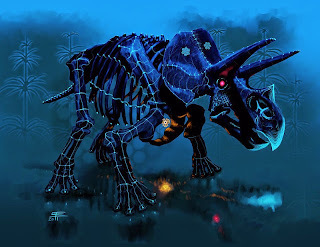 Fossils for Africa, featuring the art of Luis Rey has been published, and the artist wrote about it at his blog. David Prus expressed his gratitude for the mighty Deinocheirus this Thanksgiving. Morganucodon popped its fuzzy little head up at Mark Witton's blog. Some German-flavored paleo-blogging: Liz Martin writes about the pterosaurs of Stuttgart and Munich, Heinrich Mallison writes an account of the measurement of the Berlin Giraffatitan and provides a wealth of photos at Dinosaurpalaeo. At Saurian, Mark Wildman reflects on the recent SVP meeting in Berlin. I've been a fan of the bite-sized natural history podcast Natural Selections for a long time, and they recently had a run of episodes all about birds. Host Martha Foley and Dr. Curt Stager of Paul Smith's College discussed bird phylogeny, the colors of eggs and their shape, and the ranges of American seagulls. As an example of a Velociraptor that manages to have the presence of an actual animal that lived as well as satisfying a bit of that AWESOMEBRO badassedness the Jurassic Park films surely require, I submit Ville Sinkkonen's wonderful recent piece. Velociraptor © Ville Sinkkonen and used with permission. Check out more of Ville's work at DeviantArt and ArtStation, and consider purchasing a print from him - though he only has his popular "Dave" available at the moment, it's a hell of a piece. The Great 2014 Dinosaur Gift Guide: Volume 3! And I'm back to wrap up the gift guide, in which I gently exhort you to bestow the gift of paleoart upon your dinosaur-loving friends and relations, It's a clear win-win in that it supports independent creators who work hard to produce engaging, accurate representations of extinct life and it provides the recipient with a unique and memorable gift. Catch up with parts one and two, if you haven't seen them yet. 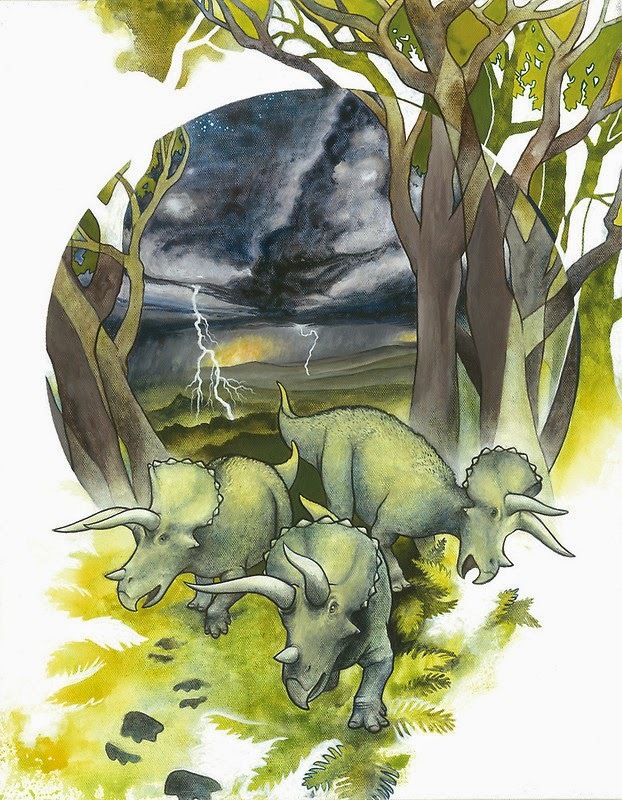 The Tales of Prehistoric Life series of books by Daniel Loxton, published by Kids Can Press. Daniel Loxton's three-part Tales of Prehistoric Life series is a great way to fill a young dinosaur hunter's bookshelf. I've given them as a gift to a precocious young paleontologist-in-training, and he was particularly taken by the books' combination of realistic dinosaurs in a narrative story. I reviewed the books here recently; take a look and see for yourself. 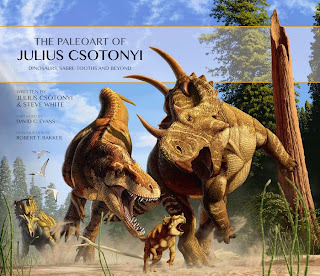 The Paleoart of Julius Csotonyi, published by Titan Books. 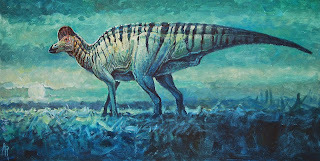 Julius Csotonyi is a modern master of paleoart, as evidenced by his winning the Society of Vertebrate Paleontology’s Lanzendorf PaleoArt Prize for 2-Dimensional Art three times. He sells prints of his immaculately rendered prehistoric scenes on his on-line store, and was also the subject of this year's Titan Books publication The Paleoart of Julius Csotonyi: Dinosaurs, Saber-tooths, & Beyond. Pteranodon © Mark Witton, via Flickr. Mark Witton is another influential figure, perhaps more than any other single artist popularizing the appearance of pterosaurs as informed by modern science. He recently began selling prints, and authored Pterosaurs: Natural History, Evolution, Anatomy, which was published last year. Top-to-Bottom: Deinocheirus by Asher Elbein, Lambeosaurus by Niroot Puttapipat, and Buitreraptor by David Orr. Finally, I'd be a poor capitalist if I did not mention that your intrepid bloggers here at Love in the Time of Chasmosaurs have their own wares for sale. I feel very lucky to share LITC with such talent. Asher's art is available at DeviantArt, Niroot's is available from DeviantArt and Redbubble, and my designs and illustrations are all at Redbubble. 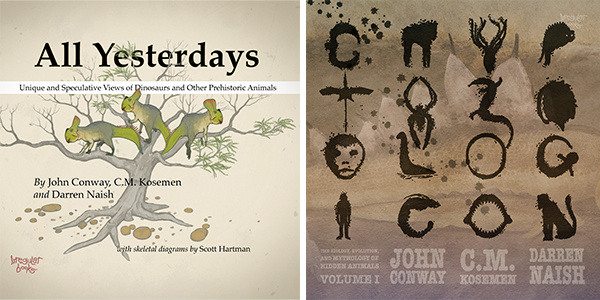 I hope this series has inspired you to support paleoartists and publishers releasing good work. There are so many options for dinosaur toys, videos, models, games, and books. If even a fraction of the people who keep the Big Dinosaur Merchandise Train rolling down the rails patronized artists and small publishers who consistently push out inspiring work, it would be a heck of a lot easier for those creators to keep doing it. The Great 2014 Dinosaur Gift Guide: Volume 2! Welcome to part two of the LITC 2014 Dinosaur Gift Guide! If you missed the first installment, check it out here. 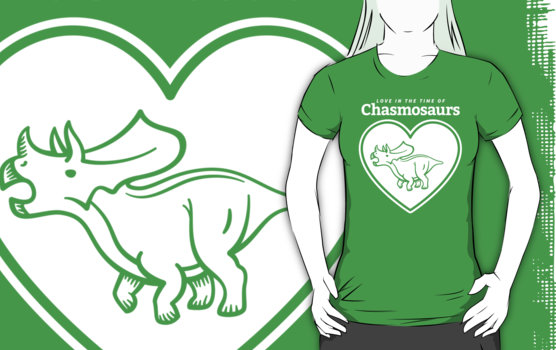 the goal with this brief series of posts is to highlight artists and other independent creators of dinosaur goods. 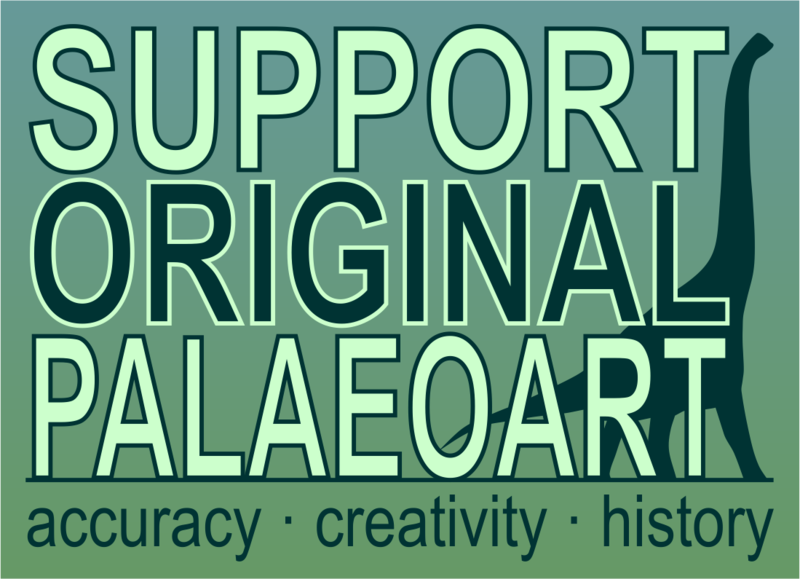 Since paleontology depends on the work of artists to reach the public, it's vital to directly support them when possible. There has never been an easier time to do it, and dinosaur lovers have never had such a wealth of amazing art by so many talented people. Onward with the second installment. I've decided to split this guide off into a trilogy to keep the post lengths reasonable, so the third and final part will be coming Wednesday! 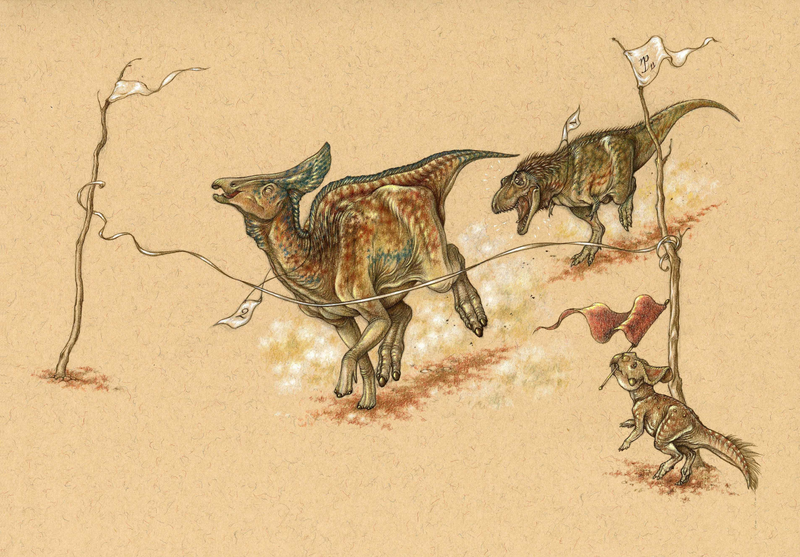 The Paleopost Postcard set, featuring the work of Tiffany Turrill and Brynn Metheney. Tiffany Turrill and Brynn Metheney are concept artists in the videogame industry, and every single time they share their dinosaur work, it's the sweetest of sweet treats. 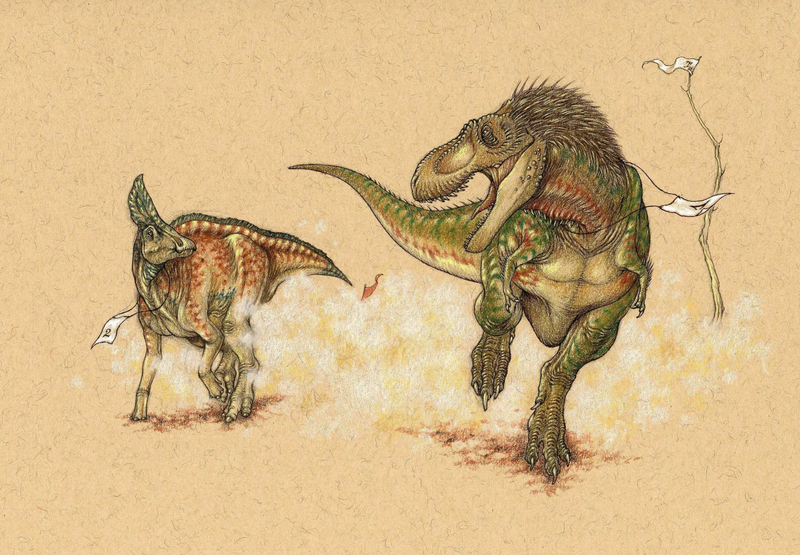 Their Paleopost postcard set is a great way to get some of their finest work in one package - saurian and otherwise extinct. 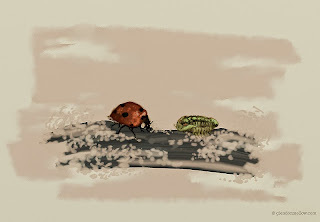 Arthropod Meeting by Glendon Mellow, available from his Redbubble shop as a print or as part of his wonderful 2015 calendar. 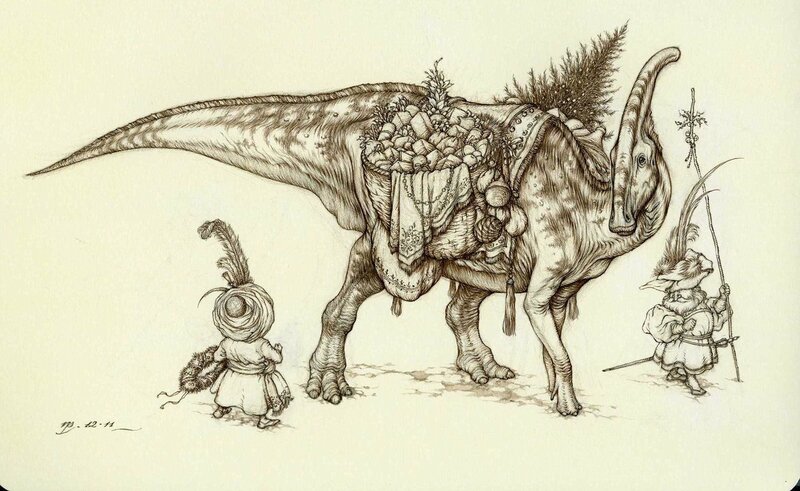 Glendon Mellow doesn't do a lot of dinosaurs, but his utterly unique eye deserves inclusion here, often drawing from prehistory for inspiration in his surreal juxtapositions. His Avimimus, available as an iPhone or Galaxy case would be a great set of training wheels for someone working up the nerve to commission him for one of his striking tattoo designs! Trikeratos by Scott Elyard, an exploration of cybernetic technology and prehistoric life, available as prints, pillow, tote bag, or tee at Redbubble. 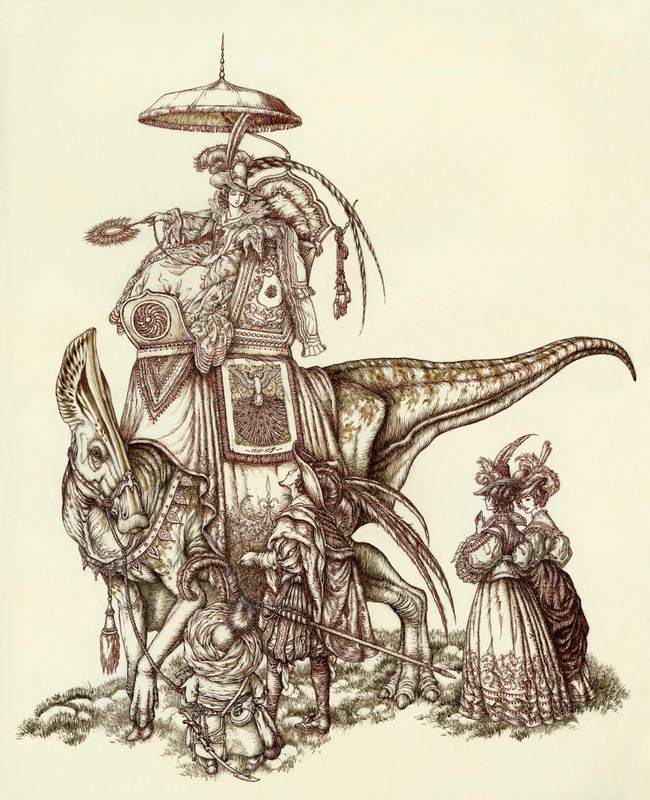 Scott Elyard also has a uniquely unfettered imagination, with a portfolio populated by cybernetic saurians and brightly colored skull portraits. Lesser Bowertyrant by Raven Amos, available as a print, pillow, or tote bag from Redbubble. Raven Amos' work is consistently eye-popping, with bold color choices, stylistic daring, and intricate line work. Raven's work is available at Neatorama as well as Redbubble. The Neatorama store also includes her Nintendo/Kaiju Mashup series. Her GaMario and Linkzilla are slam dunks. 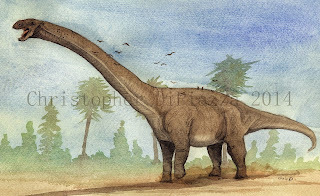 The mighty Dreadnoughtus, illustrated by Christopher DiPiazza and available as a print from the Christopher DiPiazza's Zazzle shop. Christopher DiPiazza has been sharing wonderful watercolor paintings of dinosaurs and other prehistoric beasties for a good long while over at Prehistoric Beast of the Week. 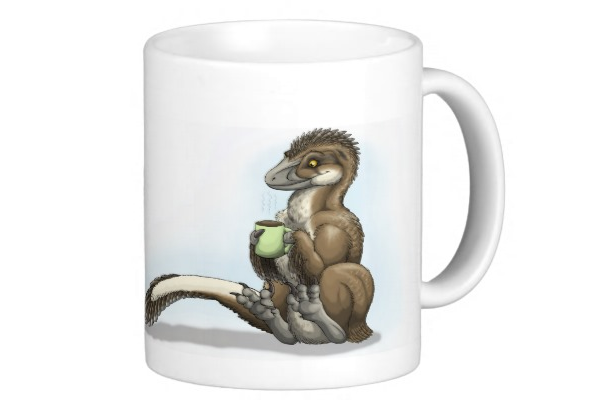 The Caffienated Raptor mug, by Emily Willoughby and available from her on-line store. Emily Willoughby is a shining star in today's paleoart universe, bringing a naturalism to her feathered maniraptors that perhaps more than anyone other single body of work invites lovers of today's extant theropods to extend that appreciation to their Mesozoic forebears. The covers of All Yesterdays and Cryptozoologicon: Volume 1, from Irregular Books. The fellows of the TetZoo/ Irregular Books empire are marvels of productivity, especially considering the high quality of their work. I consider All Yesterdays a must-have for paleoart enthusiasts, both for the sheer volume of beautiful, challenging work inside and for the way it communicates the strong tug-of-war between imagination and inference at the heart of paleontological restoration. Their Cryptozoologicon: Volume 1 applies a similar approach to the existence of cryptids. Darren Naish's Tetrapod Zoology: Book 1 would round out a nice little book set. Of course, there are other options available to support their unflagging efforts to educate and inspire natural history enthusiasts. Memo Kosemen sells prints from his DeviantArt account, John Conway sells his from his own site, and Darren Naish sells his designs on tees at Redbubble. The TetZoo Podcast also has its own Redbubble shop. We'll wrap up with the third part on Wednesday, which will include even more artwork and books to stuff those stockings with. 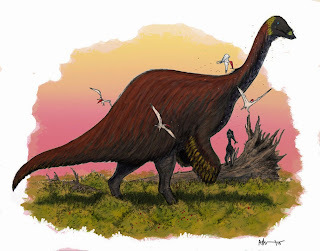 The publication of new Deinocheirus mirificus material, finally fleshing out the body that was attached to those enormous arms, made a huge splash last week. Or, I should say, finally officially fleshing it out. 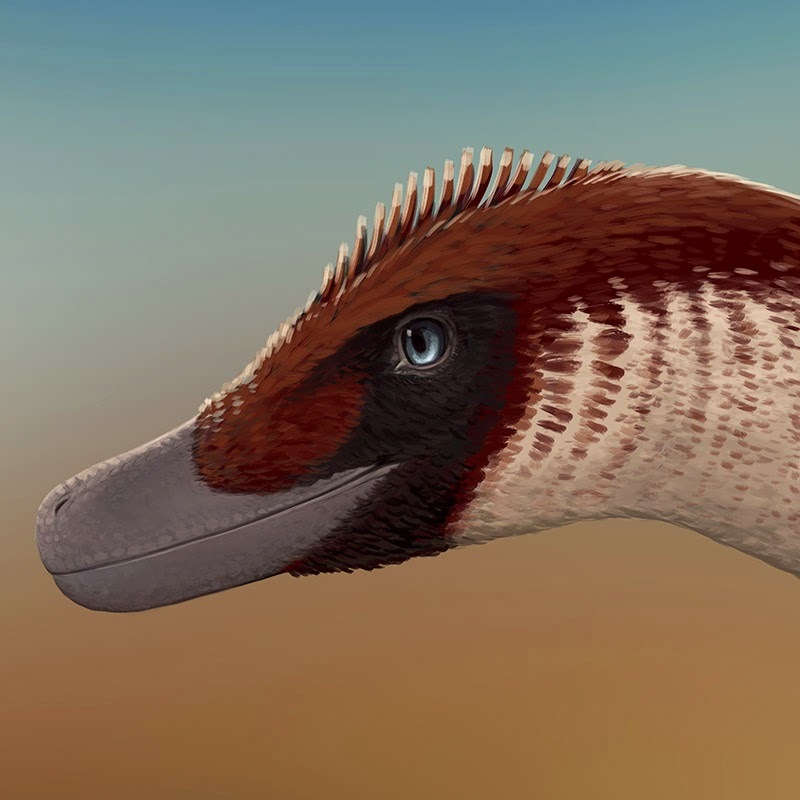 We've known about the new Deinocheirus in broad strokes in a back-channel, unofficial sense, since last year, after paleontologists and other attendees of the Society of Vertebrate Paleontology's 2013 meeting had a peek at it. It only took an additional year for the thing to actually be published. 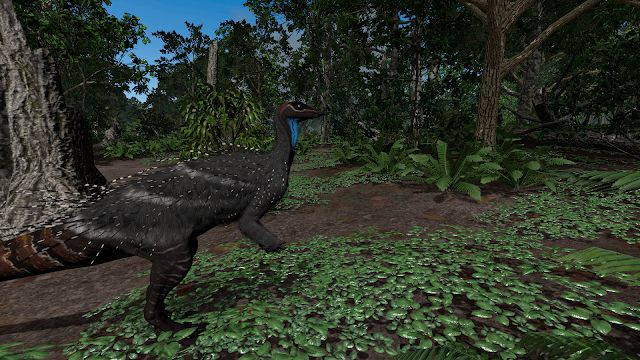 Our new Deinocheirus builds on what Brian Switek described last November: a weird, hump-backed, giant ornithomimosaur. Since then, the head has turned up. How the head was procured from the black market has not been explained in detail, and that's a story I'm really interested in hearing. More about our new superstar dinosaur: Ed Yong wrote about it at not Exactly Rocket Science. Ian Sample covered it for The Guardian. PRI interviewed Steven Brussatte about it. BoingBoing's Rob Beshizza called it adorable. The Associated Press put the image of a Barney/ Jar Jar Binks hybrid in our minds, threatening our collective sanity. Andrea Cau's multi-part series on the beast begins here. 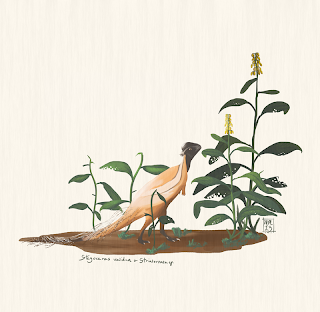 Finally, see John Conway's wonderful illustration of a Deinocheirus pair, and buy a print for someone you love. You've probably seen the "tiny Brontosauruses" illusion meme pop up on Facebook or Twitter; if not, check it out at SV-POW. At this point, the original source of it is irretrievably lost, as it's reshared over and over. Search "tiny brontosauruses" on Twitter and marvel at all the spammy accounts claiming it as their own. And all the people who don't really care where it came from, because who really worries about something silly as who creates images? That's so last century. A cool bit of Triassica: Thousands of burrows ranging from 14 to 40 cm (~5 to ~15 inches) in diameter have been found in the ~210 million year old Petrified Forest Member of the Chinle Formation in the vicinity of Canyonlands National Park in Utah. They had been provisionally assigned to lungfish, though more research was needed. At the Geological Society of America's annual meeting in Vancouver, Stephen Hasiotis presented a poster offering a new interpretation of the burrows: tetrapods, perhaps small therapsids, due to similarities to Permian burrows. If you like your dinosaurs on the campy side, see Kevin Dart's "Queen of Dinosaur Island" poster art Michael Ryan shared at Palaeoblog. Check out the amazing winners of the Dinosaur Toy Forum's Diorama Contest. Really creative use of photography across the board. Jaime Headden posted a wonderfully illustrated big-picture piece about toothed birds at the Bite Stuff. Albertonykus was able to visit the National Geographic Museum's Spinosaurus exhibit, and has a report. I'm hoping to have the chance to see the exhibit in February, fingers crossed! Meet the Underwhelming Fossil Fish of the Month! At the University College London's Museums and Collections Blog, Mark Carnall writes about the unloved Devonian ray-finned fish Cheirolepis. Robert Bakker presented a poster at the GSA meeting: Stegosaurian Martial Arts: A Jurassic Carnivore Stabbed by a Tail Spike, Evidence for Dynamic Interactions between a Live Herbivore and a Live Predator. And he illustrated it, too! Here's the newest Bakker original, seemingly a single screencapped moment from an animated battle. 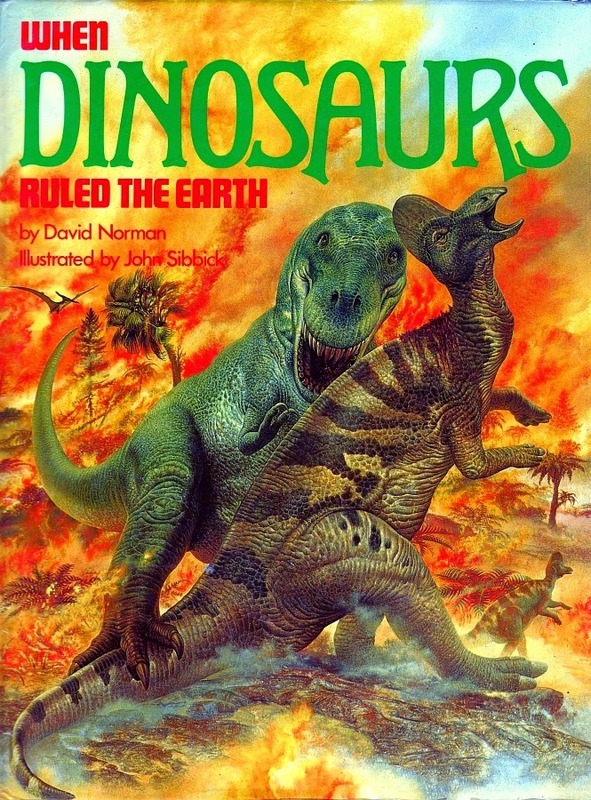 In terms of saurian-related output, the BBC is best known these days for Walking With Dinosaurs, the super-expensive CG-laden Brannagh-narrated behemoth, sire of numerous tie-in books (and a movie that we won't mention). Nine years earlier, however, Auntie Beeb saw fit to give its endorsement to this little lost nugget of dinosauriana - The BBC Book of Dinosaurs. 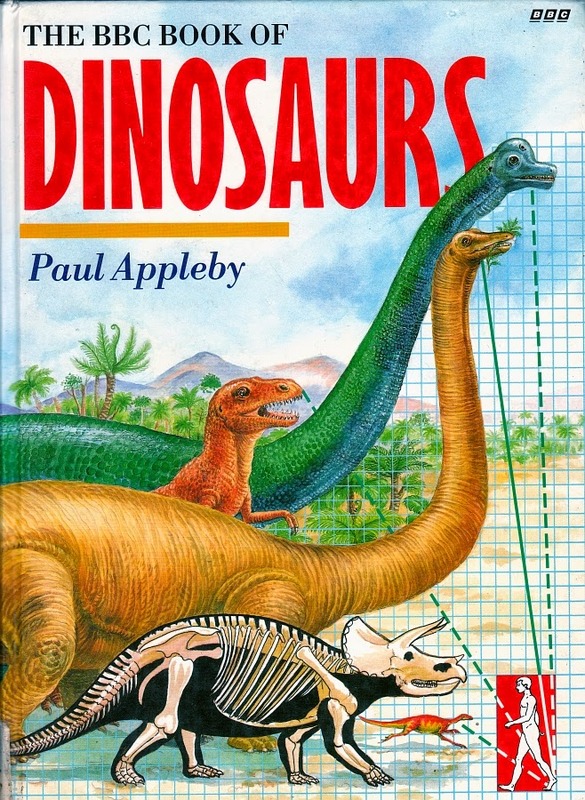 Authored by Paul Appleby and illustrated by Gill Tomblin, this rather obscure book is sweetly nostalgic for those of us raised on slightly shonky early '90s dinosaur books...even if we'd never actually seen it until now. Bob Walters and Tess Kissinger, known for their terrific paleoart studio, have launched a multimedia educational website called DinosaurChannel.tv. In order to pack it full of cool content, they need a bit of help, and have launched a Kickstarter campaign. Here's their video. The site is up, though not updated with a lot of content, but the Kickstarter project video here gives a good taste of what they'd like to do. I especially liked the illustrated title cards for the different series, which strike a great balance between "accurate" and cartoony, and the hand drawn lettering is terrific. There's a lot of potential, so hop over and throw some money their way - or at least spread the word so fellow paleo-geeks can help out. As an admirer of their work, I'd love to see what they can do with full funding. I recently had the pleasure of being commissioned to create a new logo for the Dragon Tongues podcast, and since I'll take any opportunity to share relevant work from my livelihood at LITC, here it is. Dragon Tongues is the creation of Sean Willett, and it's highly recommended if you haven't had the chance to hear it. As luck would have it, Sean and I were both fans of each other's work, and the process was a lot of fun from start to finish. We met via a video chat (the future is truly here, isn't it?) and hashed out some basic ideas. Besides the need for the work to stand out on the iTunes podcast browser, I knew that it needed to have an aaspect of intimacy to it. Sean does an incredible job recording and producing his podcast, with the result feeling like you're an audience of one, listening to an expert storyteller. That sense of intimacy and a respect for scientific and natural history were guiding lights as I developed a few different ideas. All involved Megalosaurus in some way, to honor its important role in early dinosaur paleontology. 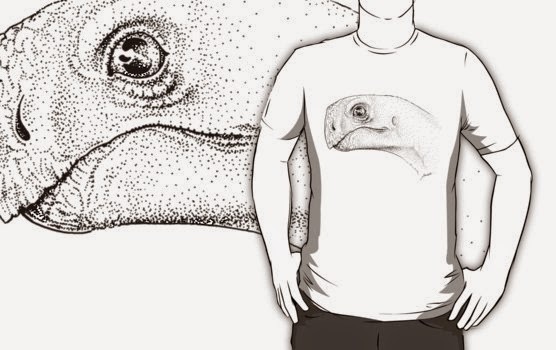 Of theses ideas, Sean was smitten with the design you see here, featuring a juvenile and parent megalosaur in front of a mountain range that bears a strong resemblance to a certain iconic fossil. Anyhow, go listen to the show! Visit the official website, find it on iTunes, follow Sean and the show on Twitter, and pick up a tee shirt at Redbubble. Oddly enough, I have another commission for a soon-to-be-announced paleontology podcast I'm really excited to hear, and to share here. Stay tuned! Venezuela has gained another non-avian dinosaur taxon, making 2014 something of a boom year for the early Jurassic La Quinta Formation. Following the publication of Laquintasaura venezuelae in August, we now welcome Tachiraptor admirabilis to the fold. Mike at Everything Dinosaur has terrific pieces on both taxa: read his takes on L. venezuelae and T. admirabilis. Because of my recent post on dreadful stock image dinosaurs, please note that each of these publications were accompanied by commissioned illustrations for their press releases (by Mark Witton and Maurílio Oliviera, respectively), resulting in the public reading stories illustrated in thoroughly non-embarrassing ways. Which is always nice. A late Cretaceous ankylosaur from New Mexico was described in PLoS One in September, dubbed Ziapelta sanjuanensis. Lead author Victoria Arbour wrote at Pseudoplocephalus that this new armor-bearer "doesn't seem to be particularly closely related to the other ankylosaurid from the Kirtland Formation, Nodocephalosaurus. Instead, it's a close relative of Euoplocephalus and friends from Alberta." 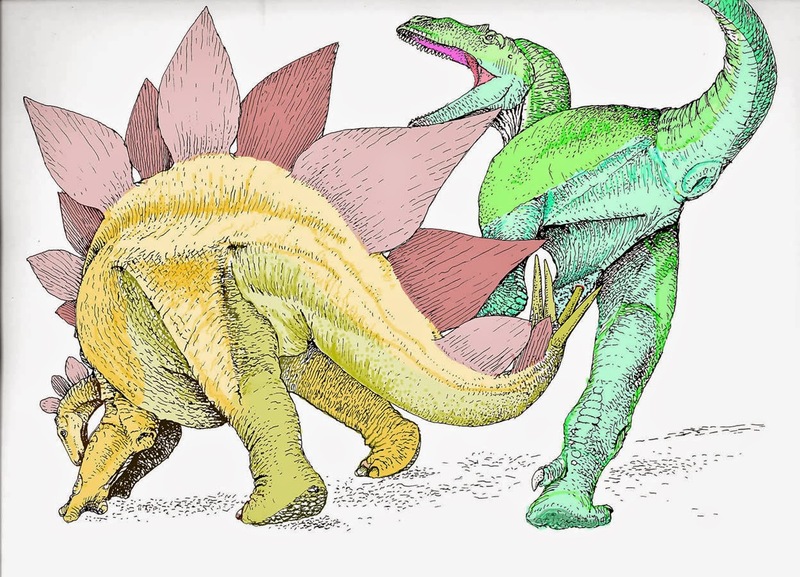 Read more on Ziapelta and its implications for ankylosaur evolution from Brian Switek. Mary Anning's name is well-known, but what about other early female pioneers in paleontology? Fernanda Castano fills in the blanks at Letters from Gondwana with a post about Mignon Talbot and Tilly Edinger. At Hawkmoth, Amy McDermott wrote about communing with Sue. Zach Miller has returned to paleontology blogging, with his new posts at Waxing Paleontological. Hop over to welcome him back, and to read why he is greatly annoyed by the practice of naming new taxa after place names. So, our first news item up top is perfectly suited to peeve him. Over the summer and fall, Mark Wildman has written a fossil hunting diary at Saurian. Read about his amble for ammonites in From the Toarcian to the Callovian: Parts 1, 2, 3, 4, and the addendum, which is essential to you intrepid explorers looking to replicate his journey. Herman Diaz continues his book review posts at ART Evolved, and recently gave the thumbs up to Prehistoric Monsters and a big thumbs down to Brussatte and Benson's Dinosaurs. If you find yourself nodding along, be sure to click through to Amazon to upvote the reviews. Robert Alicea still occasionally draws dinosaurs at Doodle of Boredom, such as a recent, adorable Allosaurus hug. At the Dino Toy Blog, Gwangi writes about a 90's Velociraptor figure that *wasn't* influenced by the omnipresent JP design. Matt Martyniuk also offered a critical look at a feathered theropod toy at Dinogoss with a look at a museum-endorsed dromaeosaur figure that nonetheless gets the feathers wrong. Why not continue the theme of feathered Mesozoic dinosaurs and how to restore them? Here's a terrific graphic by artist Mette Aumala, AKA Osmatar at DeviantArt. It's been shared around social media recently, as well as being tipped to us by reader Lew Lashmit. I love the subtlety of the humor.